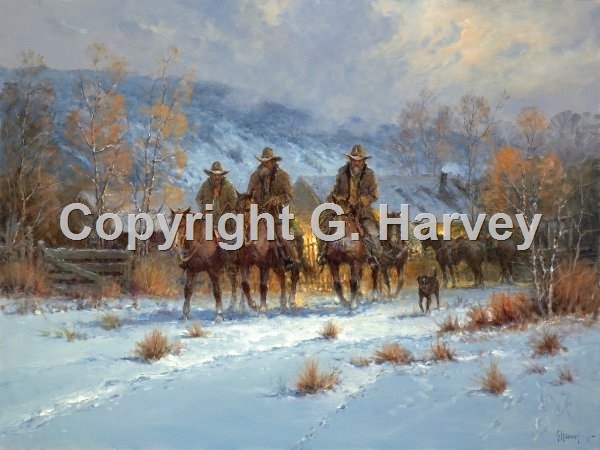 After decades of painting subjects ranging from New York to International cities to the Civil War, G. Harvey always returns to his heritage, the American West. Growing up, he heard tales from his grandfather about life in Texas at the turn of the century, which intrigued him and played on his imagination and creativity. And today, years later, it is still portraying the life and hardships of the American cowboy that gives him the most pleasure. Those stories still live on in his mind and in his heart - where great paintings begin.